Funeral Services for Mrs. Helen J. Stuckey will be held on Tuesday December 19, 2017 at 3:00 PM at New Macedonia Baptist Church Irwinton, GA. Interment will follow at Red Level Cemetery. Elder Rod Chatman will officiate. 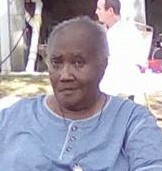 Mrs. Helen James Stuckey was born on July 24, 1942 to the parentage of the late Mr. Thelmus James and Zora Bonner James. Helen attended the Calhoun Consolidated Schools. She was a member of the Repairer of the Breach Apostolic Faith Church. She was an active mother of the church until her sickness. HEr favorite hobbies were completing word searches, watching T.V, making quilts at the senior citizen center, playing Sudoko and Solitaire. Helen's precious memories will always be cherished through her devoted sisters, Aretha Jones and Candace Whipple, and brother Frank Brown. She also leaves behind her devoted friend, Addie Knight, along with a host of nieces, nephews, relatives, and friends. Mrs. Stuckey will be placed in the Sanctuary of New Macedonia Baptist Church one hour prior to service hour. Wilkinson County Memorial Chapel, Irwinton has charge of arrangements.